Raise lots of money quickly by letting your supporters know about BIG donations! Simply by switching their insurance or utility supplier, each of your supporters can raise up to £200 for your cause. Each year, a typical family insures their home and car, changes their gas and electric supplier, purchases a new TV package and take a new mobile phone contract. 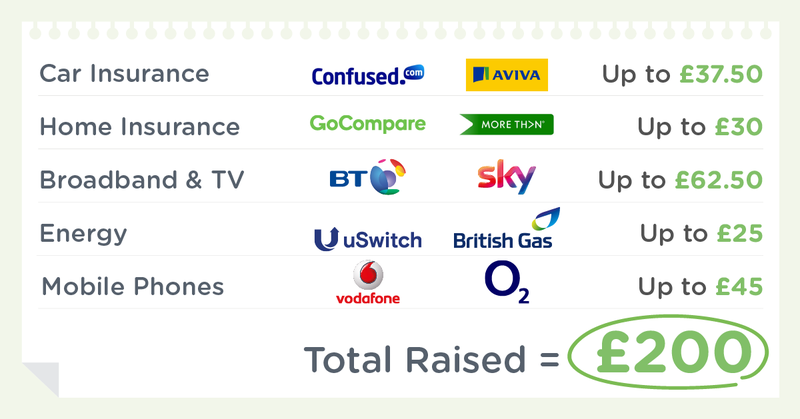 easyfundraising partners with the biggest and most trusted insurance and utility suppliers, so your cause can really benefit from this. For example, right now Aviva will donate up to £30, More Than up to £22.50, Vodafone and EE up to £35, SKY up to £52.50 and British Gas up £25, to name just a few. Top tip: Your supporters will be doing this already, so use the Facebook post and email below to remind them to switch with easyfundraising – and watch your funds grow! Every supporter could raise £200 in FREE donations when they switch their insurance, energy, broadband & TV and mobile providers. Share this image on your social media pages to encourage your supporters to shop via easyfundraising and raise bigger donations for your cause. An A3 poster to help you to show your supporters how they can raise bigger donations for your cause through easyfundraising. An A4 poster to help you to show your supporters how they can raise bigger donations for your cause through easyfundraising. An A5 flyer to help you to show your supporters how they can raise bigger donations for your cause through easyfundraising.